This year's hosting of the Special Olympics World Games was truly a testimonial to just how far and wide High Hopes can reach to touch the lives of individuals, and it gives me great pride to see the interna tional acclaim that High Hopes has achieved. • First and foremost, quality personalized equine programs integrated with complementary services and activities to help those, who in our professional judgment, will benefit from our programs. We are now a major part of a global movement to bring therapeutic riding to more and more people through the excellence of our organization. This excellence is exemplified by our highly qualified staff and governing board, carefully trained and,selected horses, and a full complement of extremely dedicated and talented volunteers. 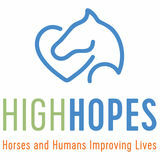 • Training programs for High Hopes participants , volunteers, and horses. In addition, as a leader in the therapeutic riding industry, provide NARHA approved training to meet the needs of other therapeutic riding programs nationally. Along with our international strides, High Hopes has taken important steps organizationally to prepare itself for the future. This year, we directed our efforts toward building our Endowment to ensure that our financial needs will be met well into the 21st century. • National leadership in research, and advocacy for the benefits of therapeutic riding and other equine activities . We also took the essential first steps of a compre hensive long-range planning process by reaffirming our Mission and developing a Vision and Values statement. Thiswillbe the core of our 5-year Strategic Plan. Another major step toward preparing High Hopes for future growth was the completion of a long awaited Caretaker's Cottage and expansion of the office space. These facility enhancements have opened up a whole new realm of possibilities for improving and extending the therapeutic riding and training services that we may someday provide. • The importance of compassion and sensitivity for our horses and participants. • The potential for improvement in the lives of our participants. • The therapeutic and rehabilitative value of the equine experience. • The immeasurable worth of our volunteers. Presiding with the High Hopes Board of Directors over the past year has left me with tremendous gratitude and appreciation for the commitment and ever-increasing dedication of our staff and volunteers. I wish to thank all of you for your boundless energy and heart for High Hopes - and for making this year one of inspiration and growth toward the future. • The leadership role of our Board of Directors. • The professionalism of our staff and programs. • The appropriate quality horses to suit our participants' individual needs. • The effective allocation and efficient management of our resources and facilities to ensure high quality and maximum impact. • The opportunities to extend and diversify our services to reach a wider community. Dear High Hopes Family, Wecan all take great pride and share in the accomplishmentsof High Hopes over the past year. It was a year that started and ended with milestoneachievements, opening with the SpecialOlympicsWorldGamesand closingwith the reaccreditationof High Hopes TherapeuticRiding,Inc.by the North AmericanRidingfor the HandicappedAssociation(NARHA). their families,horses,volunteersand staff,to keep Sis's dream alive! High Hopes remains indebted to those wlio supported its early membership appeals with a long term commitment. 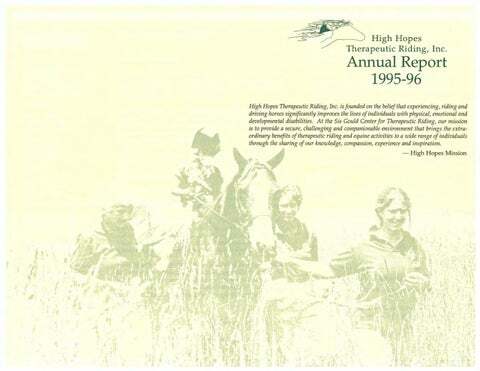 Special thanks is extended to all those who gave so generously to the Annual Membership Appeal It provided vital operating funds for High Hopes in the amount of nearly $60,000. Our operating funds enable us to provide our riding services to all riders for just 30% of the real cost to High Hopes, acting essentially as a "natural" scho1arship fund for all riders. Charlotte Quigley Mr. & Mrs. Jofin Rafal Dr. & Mrs. Robert C. Recor Kathy Reese Mr. & Mrs. William B. Reese Mr. & Mrs. Thomas J. Rodgers Kate Dupont Ross Mrs. Peter Sanger Robert Schneider Mr. & Mrs. Stanley C. Schuler Mrs. Mary Peck Schwartz Deborah McLennan Scully Mr. & Mrs. Douglas Seaman Paul E. Betts, Shawmut Bank Bill & Petra Shearer Alger Shelden, Jr. Jessie Y.Shepard Kathleen Skolem Mr. & Mrs. Harry S. Slifer, Jr. Carolyn Smith Dr. & Mrs. Wayne Southwick Helen B. Spaulding Mr. & Mrs. Louis Starr Meredith & Rebecca Stoever Mr. & Mrs. Frederick Sturges Ms. Peg Sweeney Mr. & Mrs. William R. Taylor Mr. & Mrs. Benjamin C. Thomson Dr. & Mrs. Paul H. Urband Mr. & Mrs. William V. Washburn Elizabeth Watkins Mr. Gurdon B. Wattles Mrs. George T. Weymouth Mr. & Mrs. William White Mrs. Edward P. Williams Charles L. Willoughby Judy & David Winer Mr. George D. Wrightson, Jr. This report to our members and supporters is dedicated to our founder and eternal inspiration, Mary K. "Sis'' Gould ... to her indomitable spirit, and to her undying belief that therapeutic riding and carriage driving can bring immeasurable good and love into the lives of those who need it so much. We dedicate this annual report to her to mark the year in which she passed, with the hope that her inspiration and vision will continue to guide us from this day forward. With her perpetual guidance, High Hopes holds great promise to seek ever greater heights and new horizons for the future of therapeutic riding and carriage driving, and to continue to be the "best at what we do." High Hopes is extremely grateful to the individuals and foundations who gave to the Endowment Fund. Since only a _portion of the Endowments interest is used each year, these gifts will continue to grow ID perpetuity to sustain the High Hopes programs well into the future. High Hopes never turns away a prospective rider due to Jack of funding. This policy is enabled by the generous support of community, ,corporate, foundation, and individual scholarship gifts and grants. High Hopes thanks those who have seen a particular need at our facility and have prov ided the resources to meet that need. High Hopes appreciates those who have chosen to honor the memory of their family and friends with a gift to High Hopes. High Hopes is grateful to those corporations wflo extend their support to the High Hopes Mission. Champion International Corporation The Chase Manhattan Foundation JPMorgan Pfizer Inc.